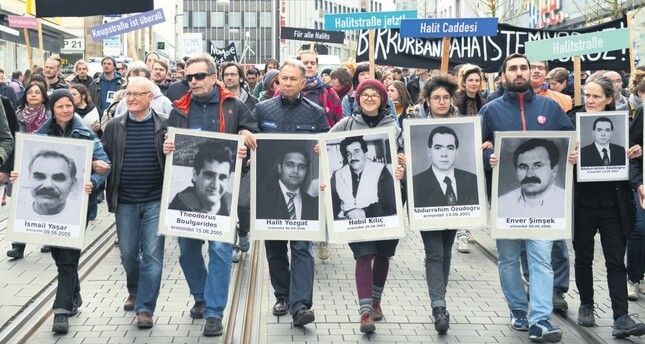 Demonstrators walk in Kassel, Germany holding posters of people killed by the NSU, April 6, 2017. Questions matter, especially if they are left unanswered for a long time. Over the course of the last five years, numerous questions have been begging for explanations. In one of the most notorious trials in the history of the modern Germany that we know today, the verdict on one of the most notorious Nazi gangs, the National Socialist Underground (NSU), is set to be announced. The tragic story concerns the brutal killings of eight Turks, a Greek and a German police officer. In September 2000, Enver Şimşek had no idea that he would be at the center of what would unfold into a killing spree by several extremist Nazi fans. At the age of 38, Şimşek was murdered in front of his flower stand in the German city of Nuremberg. Little did he know on that day that he would be the first ever victim of the bloody terrorist group. The killing did not stop. Nine more innocent people were to come. Abdurrahim Özüdoğru, Süleyman Taşköprü, Habil Kılıç, Mehmet Turgut, İsmail Yaşar, Theodoros Boulgarides, Mehmet Kubaşık, Halit Yozgat and Michele Kiesewetter were also killed. From September 2000 to April 2007, the date of the last NSU murder, gang militants enjoyed the freedom of traveling to all corners of Germany to pour out their hatred even more. The NSU murders span across Germany from the very south to the north and from the west to the east. The NSU is known to have been established by three neo-Nazis. Uwe Boehnhardt, Uwe Mundlos and Beate Zschape. The story of how Boehnhardt and Mundlos ended up dead in 2011 is also another shadowy part of this endless trial that awaits answers. Following a failed bank robbery, the German police say, Boehnhardt and Mundlos were found dead of gunshot wounds on Nov. 4, 2011. The two terrorists are said to have committed suicide. Only four days into the deaths of Boehnhardt and Mundlos, Zschape turned herself in. On May 6, 2013, the NSU trial was initiated with only one founding member of the NSU. Thousands of questions had already piled up. Yet, the most crucial ones were the following: How could such dangerous and neo-Nazis move back and forth through all parts of Germany to commit such crimes? How could they have been not stopped? How did they pick out their victims? What was the role of the German state in it? How responsible is German intelligence? The same questions are still being asked after five years. Moreover, missing confessions, missing witnesses and missing DNA records of the perpetrators have all cast shadow on the credibility of the five-year trial in Munich. Germany, though, had promised otherwise. German Chancellor Angela Merkel pledged in 2012, even before the trial kicked off, that German authorities "are doing everything to solve the murders, uncover the accomplices and individuals behind these crimes, and bring all perpetrators to justice." What lies before the eyes of each and every person familiar with the case today, however, is far from Merkel's promise. Antonia von der Behrens, lawyer of Kubaşık's sons, for example, argues that the German domestic intelligence agency and German state intelligence agencies "have systematically thwarted and made impossible the investigation of the 10 murders, 43 attempted murders and 15 robberies." Furthermore, Carsten Ilius, another lawyer in the case, said there has been obstruction of investigation into the NSU. Ilius points to Lother Lingen. Lingen, who was in charge of the German domestic intelligence agency's division responsible for monitoring the far-right scene, is accused of destroying documents that could have shed light on the NSU's murders. What motive did German authorities have in the cover-ups? Did somebody instruct German authorities to keep the case in the dark? These are two other vital questions that have gone unanswered so far. Several intelligence officials have resigned since the trial started, but no legal proceedings are underway on possible negligence and cover-up related to the case. Mehmet Daimagüler, another lawyer for one of the victims, is of belief that the German state has not done its homework to serve justice. "All murders could have been prevented had the state done its homework, and the state did not do it. The state cannot withdraw itself from responsibility," he said. Zschape, one of the main perpetrators in the case, has not been any help for sure in shedding light on any of the questions. From the very beginning, she kept herself in the dungeons of a disturbing silence. Only once has she spoken - on the 313th day of the trial. The accused neo-Nazi said she used to have a mentality, identifying herself "with parts of nationalist thought." She claimed that nowadays she "judges people not by origin and political attitude, but by behavior." She even said that she is "sorry for her wrongdoing." Though she kept silent throughout the whole process sans one exception, despite the fact she is the only real person who has been there all along with Mundlos and Boehnhardt, Zschape was given the opportunity to offer her closing statement last week. Once again, she sought to distance herself from the killings and the brutality of the NSU, of which she was a part of. She said she saw and felt the "distress and despair" of the relatives of the 10 victims of the NSU. Well, the relatives of the NSU victims and a wide portion of people affiliated with the case believe Zschape's words are a farce. The curtains are set to fall today on the NSU case, which has been nothing but a theater for many. Whether a verdict on Zschape will fill the hearts of the relatives of the NSU victims with relief or not is, in fact, not the end of the road. Those who have been feeling deceived, misled and cheated will seek to strive until justice is done in a real sense.